Don't worry! We're rebuilding and will get you back to the good stuff! Parenting, Step Parenting, Disability....and Everything Else! In the year 2000, I thought I had life pretty much figured out, at least for a guy who had spent the last 16 years paralyzed and permanently confined to a wheelchair. As the survivor of a horrific car accident at age 19, I had rolled through some pretty rough territory, enduring not only hostile physical landscapes, but hostile attitudes of those around me as well. But in the end I had come through it all; I learned to ignore the stares, the ambivalence and the many prejudices I had encountered along the way. I was tough, or so I thought; I had come this far because I simply refused to give up, to persist and to be driven to succeed at all costs. But all of that changed the day I became a step parent. It is the year 2000, and I have become the Master of my disabled realm: I can pop up and down steep curbs in my wheelchair and make it look like child’s play. I can disassemble and pack my wheelchair into my car in under 30 seconds flat. I can swim 1000 yards non-stop in under thirty minutes using only my arms for propulsion. I can push on these wheels longer and harder than anybody, all day long, for as long as I need to without uttering a single complaint. Yet how am I going to change the diaper of this kicking, screaming two-year-old that I’ve been left alone with for the first time? How on earth am I supposed to chase this tender Kindergartener up the stairs after he has just made off with my $200 pair of Oakley sunglasses? And what will I do the day they figure out that they can take me out of action completely by tipping me over backwards in my wheelchair? They Call Me Wheels is my story, how I fell in love with my future wife Elizabeth and virtually overnight became a wheelchair-bound stepparent to her two young sons, Josh and Ben; embarking upon the most arduous, terrifying, and at the same time the most extraordinary and satisfying adventure I’ve had yet to experience. Wheels (the nickname given to me by the cocky, disbelieving cronies of Elizabeth’s ex husband) chronicles a three year span where I literally roll slap-dash and headlong into the unknown; at times I’m frustrated, foiled and ready to throw in the towel, but in the end I am actually beginning to believe that I just might be making a difference in the lives of my newly acquired family - that is, until it’s my turn to give Josh the dreaded “Puberty Talk”. 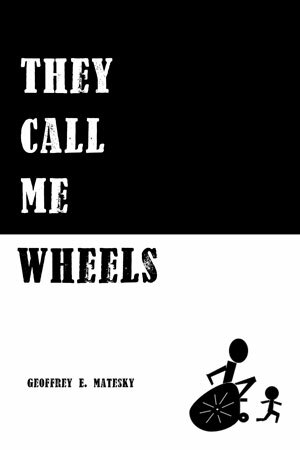 They Call Me Wheels is NOW AVAILABLE from Amazon.com, & Barnes & Noble (bn.com). If you are a bookseller and wish to obtain copies, please contact the sales department of my publisher, iUniverse.com for more details. The Blog, excerpts, and other fun stuff will be returning soon - thanks for visiting! © 2019 - theycallmewheels.com All rights reserved.